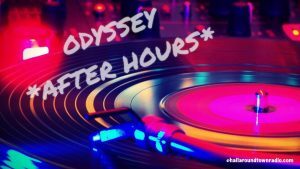 Welcome to the first episode in the fun series we are calling “Odyssey After Hours”! We will take you back to the 80’s and early 90’s where the Odyssey Club in West Carrollton, Ohio ruled the dance floor and brought thousands of young people to their feet each weekend! Show hosts, Scott Hall (aka Rockmaster Scott) and Jamie Cress (aka DJ JC) discuss the club, the music, the staff, the behind the scenes craziness and the hilarious promotions that had you all waiting for the weekend! Each episode will have a special guest joining in the conversation and telling their “stories” and best “memories” from the Odyssey days! In this episode Jamie and Scott are joined by Mike Stucker (winner of the name the show contest) who worked as a “Floor Host” (fancy word for bouncer) and also a manager of the club! So if you had fun at the “club” and enjoyed events like our “Beach Parties”, “Bikini Contests”, “Dance Contests”, “Twelve Days of Christmas” and so much more…give our show a listen! All we ask is that you “Like” “Comment” and “Share” in order to help build our audience here on the Odyssey Facebook Page! You can subscribe to all of our podcast programming by clicking the “subscribe” links on the hallaroundtownradio.com home page and also don’t forget to follow us on Facebook, Instagram and Twitter… (there are links on the home page also). scott September 27, 2017 . No Comments on ODYSSEY “After Hours” Episode 1. Categories: ODYSSEY "AFTER HOURS". Tags: dance, daytonsbestdanceparty, Interviews, music, Odysseyclub, odysseywestcarrollton, talk.